Moisture-related building damage from water, vapor and ice can quickly escalate into large-scale problems for facility managers. For this reason, it is important to protect your roof deck from the costly deterioration and damage caused by moisture penetration. Given the significant capital investment involved when a roof must be repaired or replaced, it is important for facility managers to utilize new advancements in roofing technology to help ensure a roof’s long-term performance. Let’s take a look at some of the recent building-science innovations in asphalt roofing systems that can help control moisture on the roof deck and ultimately protect your overall investment. Most leaks occur where roofs meet sidewalls and around penetrations such as skylights, vent pipes and chimneys. As a result, leading asphalt roofing manufacturers have applied new innovations, breakthrough design and sophisticated product testing to develop protective roofing systems that guard every part of the roof. In addition to asphalt shingles, hip and ridge shingles and ventilation, a complete roofing system also includes accessories designed to work together beneath and around shingles to provide secondary protection that helps shield the deck from wind-driven rain and other moisture penetrations. The most important of these accessories is the underlayment. Proper installation is critical for system performance. Most manufacturers create installation instructions that define how products are used together so that they perform as expected. Underlayment is considered a roofing accessory, but don’t let the term “accessory” distract from the vital layer of protection it delivers. When installed on top of the sheathing, the underlayment is designed to prevent moisture damage. When selecting an underlayment, it is important to differentiate between the standard organic felt and the self-adhering products that keep out ice and water. An asphalt-saturated felt underlayment helps to keep the deck dry until shingle application is completed, thereby allowing one to avoid the problems that can result when shingles are placed on wet decks. It also offers protection from resins that may come from wood board sheathing. Many leading asphalt roofing manufacturers have contributed to a surge of innovation in underlayment technology, resulting in a more sophisticated selection of materials and easy-to-install product options. With increased material options available today that range from thick felt, mat-faced and granulated products, facility managers are better positioned to select the best underlayment solution for their building’s slope, location and overall performance considerations. Self-adhering underlayments work to prevent moisture-related damage caused by freeze/thaw cycles that lead to ice-damming, as well as wind-driven rain and water flow. In fact, many of today’s local and state building codes specify an underlayment to help protect the most vulnerable areas of a steep slope roof and prevent ice dams from forming. Self-adhering underlayments are also available in extra wide rolls, which improve jobsite efficiency with increasingly safe, fast and easy installation. To help keep contractors safe, some leading roofing manufacturers offer products that have anti-slip surfaces designed to reduce slipping, sticking and scuffing during installation. Ultimately, a combination of a standard and self-adhering underlayment can provide increased protection and performance for a building’s roofing system, while helping to prevent accidents during installation. Because of these benefits, facility managers should take the time to research the right underlayment for their next roofing project. The proper ventilation of attic areas is another way in which facility managers and homeowners can control moisture. Proper ventilation methods can help ensure the maximum service life of roof assembly materials, and can improve heating and cooling efficiency. Minimum ventilation requirements are specified by insulation manufacturers for energy efficiency and by building code officials for code compliance. 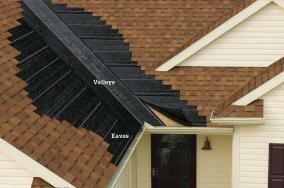 In addition, ventilation is required by shingle manufacturers to ensure the performance of the roof. Overlooking this consideration may result in moisture-related problems like premature roof failure, blistering of the roof, buckling of shingles due to deck movement, rotting wood and ice dam formation in cold weather. In the winter months, proper attic ventilation allows water vapor to escape before it condenses at the roof deck. Proper ventilation also helps to reduce the occurrence of many problems such as expansion/contraction of decking and ice damming in cold, snowy climates. Throughout the summer, proper ventilation of the underside of the roof deck can reduce heat buildup and its related problems. This protection from moisture damage is an important factor for homeowners. These many benefits make it worthwhile for facility managers to consider proper ventilation as well as underlayment products for their next roofing installation. For more information on asphalt roofing, please visit www.asphaltroofing.org.